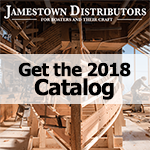 At Jamestown Distributors, we focus on having the right products, people, and technology to ensure our customers get the most out of their relationships with their boats. We know you don't have the time or money to waste on products that don't work. That is why we have spent the past 3 years working diligently to develop, test, and evaluate the TotalBoat line. Our goal is to offer products that produce great results, are easy to use, and provide incredible value. visit TotalBoat to learn more about TotalBoat products.